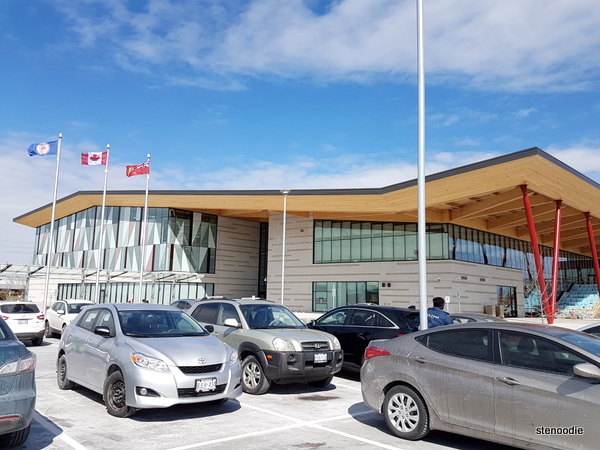 March 18, 2018: A few hours after our early morning KFC Cooking School and feast, we visited Aaniin Community Centre and Library in Markham. Aaniin Community Centre and Library is a brand new community centre in Markham that opened just a few weeks ago. 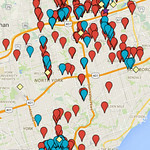 Thanks to the TorontoLife article that alerted us to it. It’s about time that something like a new community centre is built and opened for the community. It’s something so valuable and so necessary in a growing community. 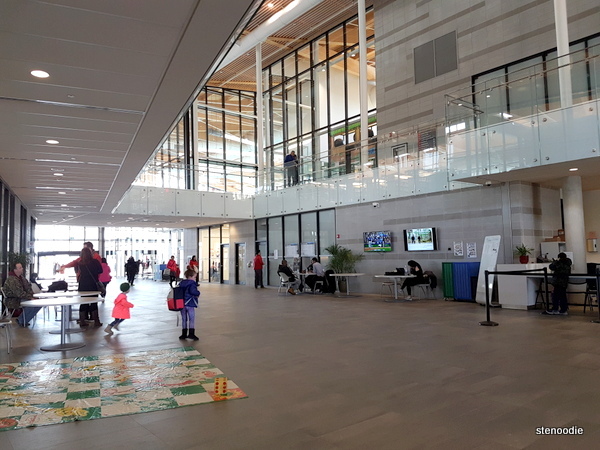 I was really impressed with this new community centre! 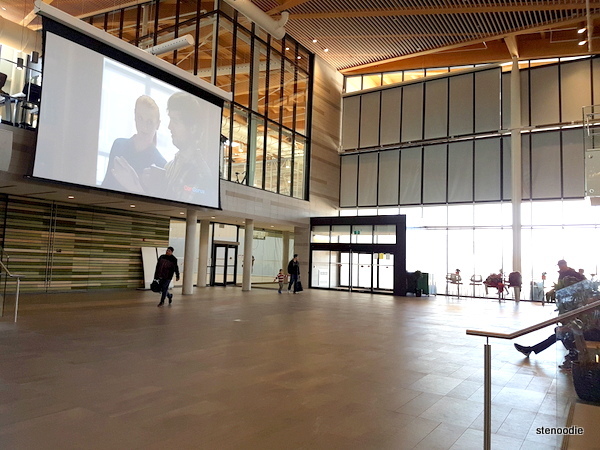 It had a two-floor library, meeting rooms, a kitchen for cooking classes, a huge atrium with a pull-down screen and area for sitting, a gym, swimming pool and rock climbing wall, a running track, and cafe too! We arrived in the late afternoon on a Sunday and there were a decent number of people here with their kids during the March Break end. We used the gym and running track on a drop-in basis and I really liked it! The running track reminded me of the one at Hart House at the University of Toronto since it overlooked a gym where kids were partaking in some activities. The gym had all the essential equipment that you would need like weights, treadmill, ellipticals, stair climber, and more. I liked how it was spacious and not many people were using the equipment. I don’t like gyms where you have to fight for a machine. I can see this community centre bringing in so much joy and value to the community. Kids and adults can spend their time here learning and exercising. (I also already can tell this community centre will be jam packed in the summer time when kids are out of school and air conditioning at home costs a lot.) It’s a very comfortable space to hang out (with fast and free wifi too!). 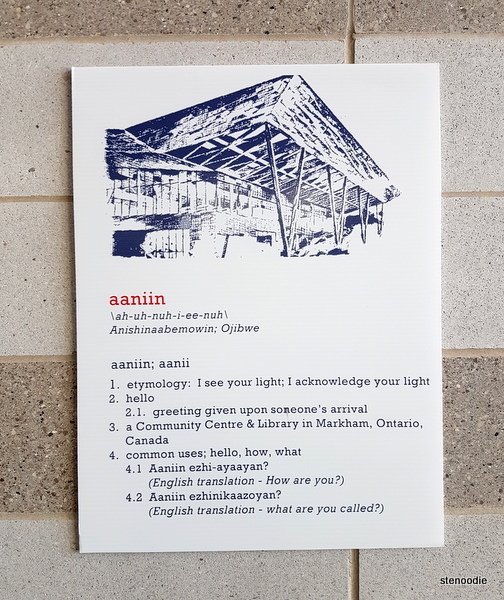 Although at first I was confused about why it was named “Aaniin”, the sign on their wall informed me that the name actually has an Aboriginal background to it, making it even more meaningful and pays tribute and respect to the ones that were here before the city of Markham was urbanized. “Aaniin” means “I see your light” or hello in Ojibwe. This entry was posted in Fitness and tagged 5665 14th Ave, @cityofmarkham twitter, Aaniin Community Centre and Library, City of Markham, community centres in Markham, free wifi, Gym, Markham, Markham community centres, Markham new community centre, places to hang out in Markham, running track, running track in Markham, swimming pool. Bookmark the permalink. Wow! That’s awesome! Is the gym free too??? Lol, no not at all. It’s like a regular gym membership where you would have to pay to use the facilities. 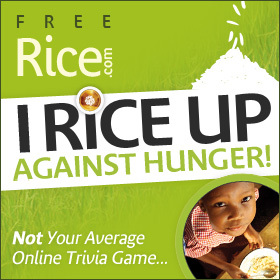 We paid for a one-day pass to try it out.